This year's Faces and Figures Show displayed 79 entries for judge Douglas Land to select for awards. He chose two Merit Awards, three Honorable Mentions and a Third, Second and First Place Award from our many talented artists of all mediums. Doug is an artist who specializes in drawing and teaches classes and workshops throughout the Tampa Bay art centers, museums and universities including the Beach Art Center, Tampa Museum of Art, and the University of South Florida. Not to mention he has also held workshops across the country. Doug has been a Courtroom Sketch Artist for Federal Court the past 5 years, with original court sketches in numerous collections throughout the United States. He is represented by Dazzio Art Gallery in St. Petersburg, FL. For more about Doug, please check out his website here. "Thank you for the opportunity to judge this excellent show. The 79 entries are well displayed and make an excellent overall impression in the gallery. As I first walked about to see the entire display, I enjoyed the variety and wonderful ways each artist approached creating portraits and figurative art. I then went about and spent time to chart each work on a layout of the room. This was a challenging show to judge as there are a large selection of very fine entries. After this I spent time to individually review and evaluate each work to determine 30 entries to do a more specific evaluation. After careful review I then had 16 finalists to score and to determine the eight award winners and their positions. I listed these finalists and then rated each in four categories with a numerical score from 1 as low to 5 as highest. The categories were overall impression, creativity, presentation and technical. I then determined the scores and confirmed the winners with my final review and evaluation. I will list the winners in reverse order from Merit Awards to First Place. The Merit Awards and Honorable Mentions are in no particular order. I will list the winners by entry number, artist name, title of piece, and media. Entry number 45, Chelsea Fors, " Paris 1", digital photo. I liked the companion piece, but felt this was the stronger work. I was reminded of the black and white photographs of city street life by twentieth century photographers such as Fred Stein and Robert Doisneau. 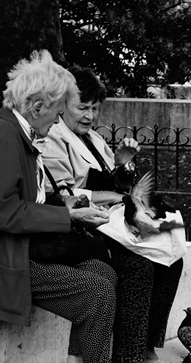 The strong diagonal pulls us in to the couple interacting with the lively pigeons. This contrasts nicely with the quiet and formal lighter background urban structures. For me, the darker wall and fence near the middle act as a solid separation from the present to the past. This makes for a nice contrast between the active and passive areas of this moment of relaxation of this couple. Entry number 79, Brent Thorlton, "Jazz", oil. This painting is telling a story with both the environment and through the solid design. The floor boards draw us in, through a door, the kitchen, and another door. The first door also separates the young man from the key elements to the left side. I wonder what the man is writing, and does it have anything to do with jazz or the painting of the woman in the room? The cool grays and black and white of the kitchen allows much of the interest to remain in the warm colors of the foreground room. The word Jazz can represent a wide range of often lively musical expression, yet the image is very quiet and orderly in contrast. The frame also helps to create a bit of distance between the viewer and the world on the canvas. 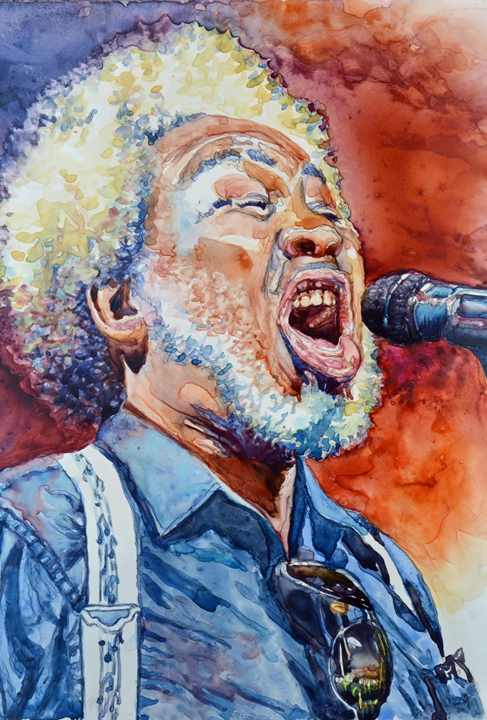 Entry number 4, Donna Morrison, " Singing the Blues ", watercolor. This image jumps off the surface and really captures the moment well. The energy of the singer is seen initially at a distance, but up close it can be seen the watercolor is applied with care. This creates an interesting design and the use of strong colors and development of a good range of values from light to dark give the work excellent depth. The bright background colors add excitement, and the use of the surrounding white areas also helps to keep the emphasis on the singer. Entry number 32, Gina Stark, " Christopher ", graphite. The frame and mat really enhance this small and delicately drawn portrait. The drawing is a bit high key, but there is a sufficient range of values to show well this image of youth. There is excellent understanding of creating skin tines as well as drawing the hair. The features and expression are well done and shows the drawing ability of the artist. This allows the viewer to enjoy a well done traditional portrait. Entry number 13, Christina Petti, " Mask ", oil. The size of this painting helps in allowing the loose and flowing design to develop the image. I believe the lack of realism helps to separate us from a fairly dark and somewhat threatening moment. The selective use of colors help to define the female form, yet I seem to see the image of a dark hand to the left as well as part of a skull for the face. This can bring up questions of life and death which can go beyond just a figure painting. Entry number 62, Joose Hadley, " Someday ", oil. The colors and composition make this an uplifting and encouraging work. The young mans eyes looking up are not the traditional way to pose someone for a portrait. The light filled and wonderfully painted sky works well with the skin tones of the young man. This painting definitely shows the skill of the artist in creating unique and interesting realism. The vignette style helps to keep our focus on the facial features as we might wonder what the importance of the moment might be. Entry number 69, Christina Pope," Walking in the Light " , photo. I kept coming back to look at this work to examine the photo, the framing and the text. They all work very well together in creating a thoughtful and unique mixed media piece. On seeing the photo, I was reminded of the black and white 1946 image by W. Eugene Smith titled " The Walk to Paradise Garden." That image is of a young boy holding the hand of his sister on a walk in the woods. In contrast, this color image is of a person on a walk in the woods with their dog on a misty day. This is an image of friendship and comfort as the two explore the natural world around them, which may appeal to any viewer. Entry number 28, Matt Ellrod, " Seaside ", oil. The large scale of the painting allows it to catch our attention as well as keep it. There is an excellent variation in textures between the water, the rocks, the sky and skin of the figure. The waves of the sea and the strong diagonal element also add some energy and movement to the otherwise quiet areas. The artist shows excellent understanding of the elements of art, composition and anatomy. The woman seems a part of the natural environment through the pose, but stands out due to the realism and color. This is a fine painting with the figure which can be appreciated in many ways."